How to Cite This Chapter: Gelberg J, Soja J, Jankowski M. Thoracentesis. McMaster Textbook of Internal Medicine. Kraków: Medycyna Praktyczna. https://empendium.com/mcmtextbook/chapter/B31.IV.24.7 Accessed April 23, 2019. Havelock T, Teoh R, Laws D, Gleeson F; BTS Pleural Disease Guideline Group. Pleural procedures and thoracic ultrasound: British Thoracic Society Pleural Disease Guideline 2010. Thorax. 2010 Aug;65 Suppl 2:ii61-76. doi: 10.1136/thx.2010.137026. PubMed PMID: 20696688. 1) A new pleural effusion, except in the case of clinically suspected transudate due to heart failure, hypoalbuminemia, cirrhosis, end-stage renal failure, or in patients with small effusions; in these circumstances, treat the underlying cause, reassess, and consider thoracentesis if effusion does not resolve with treatment. 2) Persistent effusion despite an adequate trial of therapy of the underlying disease, large unilateral effusions (particularly left-sided), symptoms of pleurisy, dyspnea or fever, or an effusion of unknown etiology. 2. Treatment of pleural effusion: Symptomatic lung compression by a pleural effusion. Usually the volumes drained during one procedure should not exceed 1500 mL due to risk of reexpansion pulmonary edema (RPE). Although rare (<1%) and not clearly associated with the volume of fluid removed, the mortality rate of RPE is as high as 20%, which explains the conservative suggestion of drainage of ≤1500 mL at a time.Evidence 1Weak recommendation (benefits likely outweigh downsides, but the balance is close or uncertain; an alternative course of action may be better for some patients). Low Quality of Evidence (low confidence that we know true effects of the intervention). Quality of Evidence lowered due to evidence based only on observational studies. Feller-Kopman D, Berkowitz D, Boiselle P, Ernst A. Large-volume thoracentesis and the risk of reexpansion pulmonary edema. Ann Thorac Surg. 2007 Nov;84(5):1656-61. PubMed PMID: 17954079. Repeat therapeutic thoracentesis may be done several hours later if there is no evidence of RPE and the patient remains symptomatic. 2. Relative: International normalized ratio (INR) >1.5 and activated partial thromboplastin time (aPTT) >2 × upper limit of normal, platelet counts <50,000/microL, lack of operator experience, small effusions (increased risk of pneumothorax), or dermatitis/cellulitis at the planned thoracentesis site. 1. 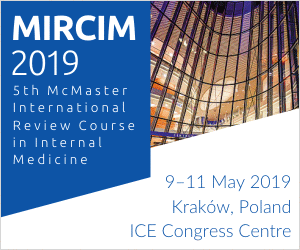 Early: Pain at the thoracentesis site, pneumothorax, hemothorax, visceral injury, vasovagal reflex, procedure failure, adverse effects of local anesthetics and disinfectants. 2. Late: Skin infection at thoracentesis site, empyema and dissemination of cancer cells along the needle track (particularly in mesothelioma). 1. Obtain informed consent. 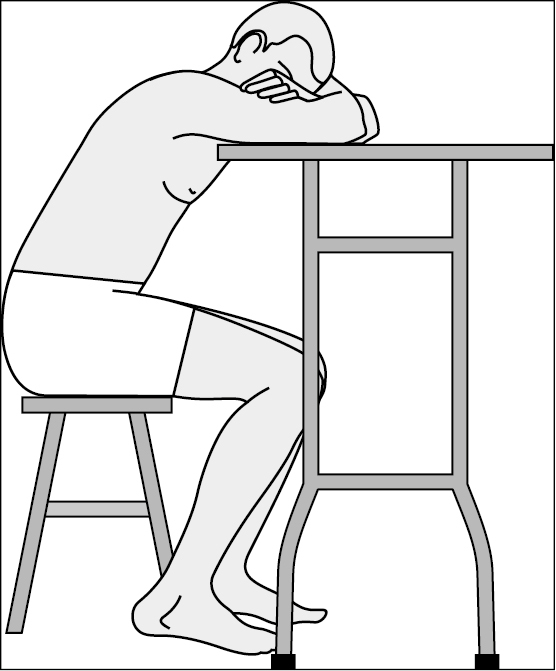 The optimal patient position is sitting with arms supported (Figure 1). 2. Tests: Review a recent chest radiograph; if available, use pleural ultrasonography immediately before or during thoracentesis (this is associated with lower failure rates and lower complication rates).Evidence 2Strong recommendation (benefits clearly outweigh downsides; right action for all or almost all patients). Moderate Quality of Evidence (moderate confidence that we know true effects of intervention). Quality of Evidence lowered due to the observational nature of most studies, and increased due to a large effect (odds ratio, 0.3; 95% confidence interval, 0.2-0.7); on balance, QoE is moderate. Gordon CE, Feller-Kopman D, Balk EM, Smetana GW. Pneumothorax following thoracentesis: a systematic review and meta-analysis. Arch Intern Med. 2010 Feb 22;170(4):332-9. doi: 10.1001/archinternmed.2009.548. Review. PubMed PMID: 20177035. 1. Surgical field preparation (see Field Preparation for Small Procedures) and local anesthesia (see Local Infiltration Anesthesia). 2. Needle (0.8 mm bore [21 gauge]) and a syringe (50-60 mL) in diagnostic thoracentesis. In the case of the anticipated collection of higher fluid volumes, use a special thoracentesis kit including a syringe, a large-bore thoracentesis catheter (bore 1.4-2.0 mm [14-18 gauge]) fitted with an aspiration needle, a three-way stopcock, pressure tubing, and a bottle for collecting the effusion fluid. 1) Chemistry (basic: protein, lactate dehydrogenase, pH, glucose, albumin [compared to serum values]; as needed: triglycerides, total cholesterol, amylase, adenosine deaminase): A dry tube, 2 to 5 mL of fluid. 2) Cell count and differential count: A dry ethylenediaminetetraacetic acid (EDTA) or heparinized tube, 2 to 3 mL of fluid. 3) Cytology: A heparinized tube (1 mL), >30-50 mL of fluid. 4) Microbiology: A sterile plastic container or transport culture medium. If infection is suspected, pleural fluid should additionally be sent in blood culture bottles (this increases diagnostic yield). Use bedside pleural ultrasound for guidance, if available (Figure 2). It is common practice to proceed with pleural fluid aspiration with the patient in the sitting position and the needle inserted posteriorly (Figure 1). Palpate the intercostal space; with aseptic technique, perform thoracentesis at the ultrasound guided site at the superior margin of a rib to reduce the risk of injury to the neurovascular bundle. In the case of large free-flowing effusions, the percussion method can be used to identify the thoracentesis site two intercostal spaces below the upper limit of the dull percussion area if ultrasound is not available. Using this approach, the needle is inserted equidistant from the spinous process and the posterior axillary line. Of note, the neurovascular bundle may not be entirely covered by the rib in this position and the triangle of safety (bordered anteriorly by the lateral edge of pectoralis major, laterally by the lateral edge of latissimus dorsi, inferiorly by the line of the fifth intercostal space, and superiorly by the base of the axilla) is considered a safer alternative by the British Thoracic Society. 1. Use ultrasound, if available, to mark the thoracentesis site. 2. Prepare the surgical field; use sterile technique (see Field Preparation for Small Procedures). 3. Perform infiltration anesthesia of the skin, subcutaneous tissues, and parietal pleura using 1% lidocaine without epinephrine (5-10 mL is usually sufficient; see Local Infiltration Anesthesia). 4. 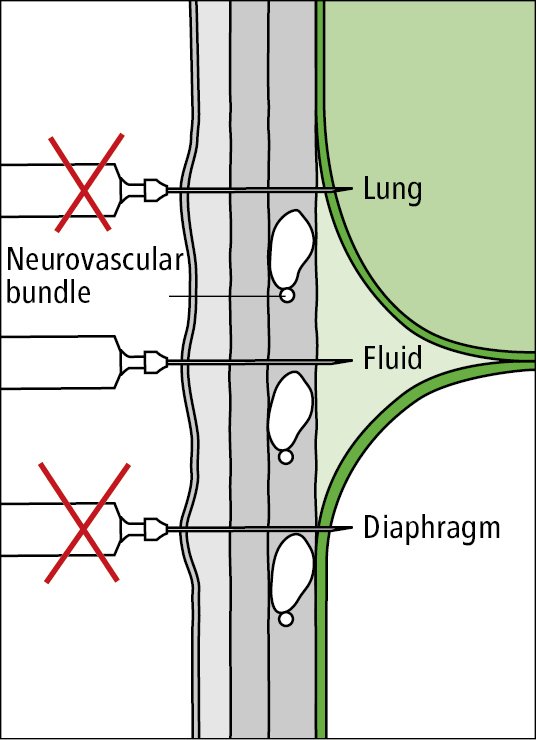 Advance the thoracentesis needle with an overlying catheter, if one is available, towards the pleural effusion along the ultrasound-marked site (Figure 3) while aspirating (constantly drawing back the syringe plunger). 5. After the fluid appears in the needle, advance the catheter further into the pleural cavity while withdrawing the needle during expiration (patient can be asked to hum during this process), then disconnect the syringe. Connect the catheter to a special kit or a three-way stopcock draining into a bottle or a bag; if a needle without a catheter is used, connect it to a 50 or 60 mL syringe before performing thoracentesis. 6. Collect fluid samples in syringes and tubes. Withdraw the needle or catheter (this is best done on expiration) and secure the thoracentesis site using a small sterile dressing. Interpretation of results: see Analysis of Pleural Fluid (Thoracentesis). Figure 1. Patient position during thoracentesis. Figure 2. 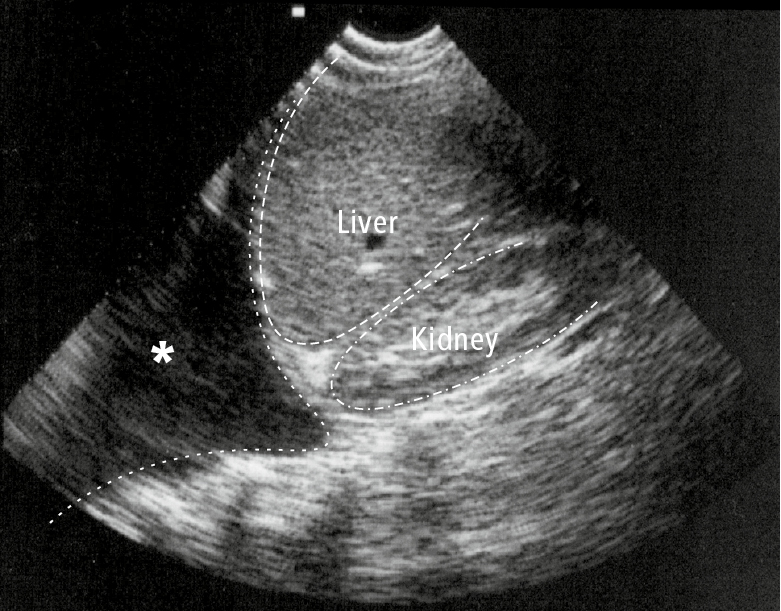 Ultrasonography of the right hypochondrium visualizing a pleural effusion (asterisk). Figure 3. Appropriate thoracentesis approach.